Shrinathji’s idol was brought to Rajasthan from Govardhana near Vrindavan to protect it from the hands of the Mughal emperor Aurangzeb who in 1665 was bent upon vandalizing the area of Vrindavan by widespread destruction of Hindu temples. 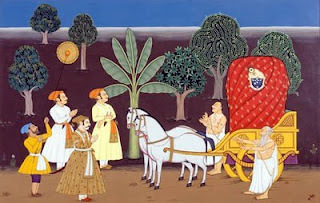 When the Mughal army came to Govardhana, the devotees of the Lord showed them the titles and gifts given to the temple by the previous Mughal rulers. The army commander then ordered the deity to be taken away from Govardhana. For almost six months the statue stayed in Agra after which the custodians of the idol of Shrinathji left that place with the idol in search of a new heaven. While several other princes were diffident, it was Maharana Rajsingh of Mewar who dared to provide refuge. The idol went on a journey to Mewar which took 32 months to complete. The decision to settle the Lord here at Nathdwara involves an interesting story. When the wheel of the chariot carrying the Lord got stuck in the mud at a place called Sihar, the Rana saw it as a divine sign that Lord Krishna wished to settle here, and thus a temple was built at this spot and the holy township of Nathdwara grew around the temple. In 1672 Lord Shrinathji was placed in a new Temple built in village Sihad, now called Nathdwara, on the banks of river Banas.